Our carpet cleaning technicicans use top of the range Prochem STEEMPRO Powerflo machines alongside eco-friendly chemicals that are safe for both childrean and pets to restore, refresh and revitalise your carpets. Our fleet of OvenKing vans and their operators are fast becoming a familiar site to residents both domestic and commercial across Dorset and Hampshire, providing solutions to both home and business alike. We are the premiere carpet cleaning service in Dorset and Hampshire. We pride ourselves on the quality of our carpet cleaning, and being a family-run business, our prices are fair and upfront -there are no hidden extras with OvenKing. What we quote you is what you’ll pay. Based in Bournemouth, we are proud to be consistently rated as the top carpet cleaning company in Dorset. You can view our indepentally verified feedback and ratings on our official Checkatrade profile page. We also have a Facebook page where you can send us instant messages and see further happy customers. Our experts are also available to give free advice on how to keep your carpets stain free and in top condition. Are you looking for an unbeatable domestic/residential carpet cleaning service? Due to the huge success of the OvenKing oven cleaning services in Poole, Bournemouth & Christchurch we have now decided to tackle the domestic carpet cleaning market. Our fully trained oven cleaning technicians are now able to offer the same level of professional cleaning to your home carpet. Using specialist carpet cleaning tools and high quality products we can tackle any size job from small single room/studio flats to larger 3-4 bedroom multi-floor houses. OvenKing are proud to offer our domestic carpet cleaning services to homeowners. Why not check out all of the great feedback we are getting on our official Check-A-Trade profile and see why everyone is talking about OvenKing. In addition to domestic/residential carpet cleaning OvenKing are now offering upholstery cleaning services where we use the same professional techniques used for carpet cleaning on your cloth and fabric upholstery. We can clean a large number of upholstered items in a matter of minutes at an extremely affordable price too. Simply call us or use our contact form to find out what we can do for you. So you have spilt something that is going to stain the carpet, such as Wine, Coffee or a Pasta Sauce on the way to the table. Follow the points below which can help keep your carpet in a more stable condition while you are waiting for the carpet cleaner to arrive. Getting the carpet cleaned in a timely manner is normally the best way to avoid the affected areas staining the carpet permanently. Removing carpet stains can be a difficult job, but using the correct equipment and chemicals in the right way can give outstanding results! Full stain removal on old or dry stains is usually nigh on impossible, our aim is to fade the stain or mark to as close to the original carpet or fabric colouring as possible. Often food, blood, vomit, and water based inks stains can be improved if tackled early enough. However if they are left the stain actually permanently changes the colour of the carpet. Other stains such as tea or coffee, milk, cream and wine must be removed from the carpet and fabric immediately. Upholstery Cleaning can be difficult. Products which might stain your sofas, or products which have no effect on how long you slave cleaning. Your furniture, especially soft goods like sofas, arm chairs and curtains see a lot of daily activity. If your home has children, family members and pets running around all over the place then no doubt your upholstered items around the house will start to suffer and show signs of wear if not kept in good check every so often. Although dirt, stains and unwanted marks are inevitable from time to time they don’t have to become permanent or become the cause of worry. Let OvenKing sort out all of your problems by offering a friendly, professional upholstery cleaning package. We are specialists in our field and are capable of cleaning a large variety of upholstered items for a highly competitive price. With our specialist top of the range steaming equipment and our eco-friendly chemicals we are sure to be able to offer a first class service every time. Our cleaning agents work above and beyond your normal ‘store-bought’ cleaning sprays and soaps, they’re powerful, while remaining completely safe to use within a confined space such as a living room and leave no harmful fumes or nasty smells which other chemicals might do. Also our chemicals are completely pet and child safe so once we are finished cleaning your room you are free to use the living space immediately. 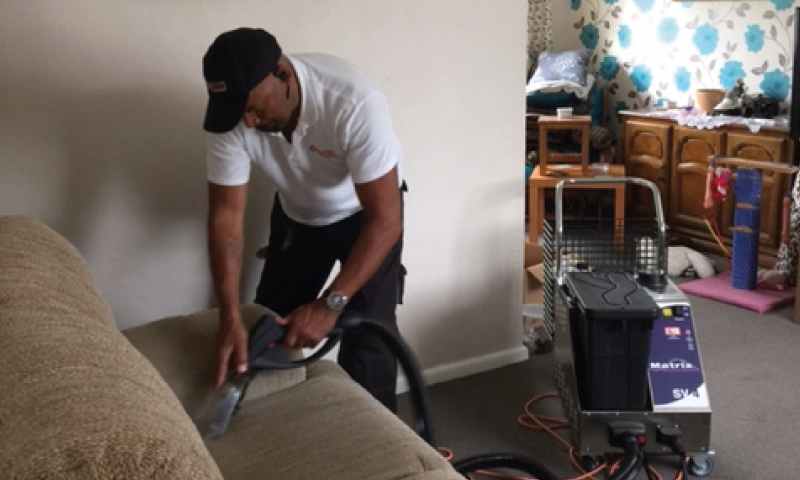 Using a specialist kind of hot water extraction to remove even the most stubborn of built up dirt and grime our upholstery cleaning service is second to none and are able to offer our services across a wide area of Dorset including, Bournemouth, Poole, Christchurch and New Milton. We are able to provide free quotations for your unique carpet cleaning request over the phone. The prices listed below are estimate, and presume a carpeted lounger/diner, hallway and a stairwell when applicable. Final prices upon your free quotation.